2019 Winners Announcement Coming Soon! The Wisconsin Lakes Partnership presents these awards each year at the Wisconsin Lakes Partnership Convention in celebration of the extraordinary volunteer and professional efforts made to protect and improve lakes in Wisconsin. The Stewardship Awards represent our best collective effort to honor and celebrate all the incredible work that goes into securing a bright future for Wisconsin’s lakes. New nominees this year, plus those from the previous two years, are considered in each category. 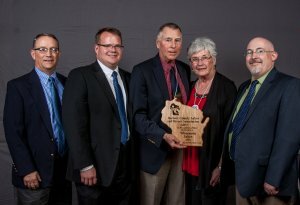 The 2019 Wisconsin Lake Stewardship Award winners and new nominees will be celebrated at the Wisconsin Lakes Partnership Convention, happening April 10-12, 2019 at the Holiday Inn Convention Center in Stevens Point. There are five Wisconsin Lake Stewardship Award categories to recognize outstanding contributions of time and effort to the future of our lakes. Awards may not be handed out in each category every year, and the selection committee reserves the right to move a nominee to a different category. Citizen: This category celebrates the many dedicated volunteers whose actions are protecting our lakes and encouraging others to do the same. They are, for example, working with local governments to ensure that land use decisions consider lake and watershed health, teaching others about lakes, and extending a helping hand to advance lake protection goals. Organized group: This category is to recognize the many types of partnerships for lake protection: lake associations, lake management districts, countywide lakes and rivers associations, conservancies, friends groups, and other collaborative efforts. A commitment to involving people in lake management decisions and being a catalyst for lake protection initiatives are a few traits of previous Stewardship Award winners in this category. In the past, the committee has chosen to award two organizations in this category, separating a regional entity and a “single lake” organization award. Public service: This category is to honor public officials and employees from state and local agencies who are really making a difference in the work they do. Building meaningful relationships, overcoming big challenges, and teaching people how to make well-informed lake management decisions are a few traits that distinguish nominees in this category. Youth: This category recognizes young lake leaders or youth groups who are getting others excited about lakes, monitoring and studying lakes, and participating in lake related projects in their communities. Business: Businesses are a key part of our team working for clean, safe, healthy lakes for everyone. This category recognizes firms that have shown outstanding commitment to the ecological health of our lakes in providing products or services to lake people and lake communities. Choose a category. Choose one of the five categories (described above) that fits most closely. The Stewardship Awards Selection Committee may elect to move a nominee from one category to another. Complete the nomination form. Please fill in all the information requested on the nomination form using word processing software (such as Microsoft Word) and send it electronically if possible, rather than mailing paper copies. Gather at least 2 letters of support explaining why the nominee is deserving of the Wisconsin Lake Stewardship Award. The nominator must submit at least 2 letters of support from individuals or groups with knowledge of the nominee’s efforts and, better yet, experience working with the person or group who has been nominated. No more than 5 letters of support will be accepted. Please keep all letters of support to no more than 2 pages. More letters of support will not translate into a higher ranking of the candidate— the Awards Committee seeks quality over quantity. Please provide these letters electronically if possible, rather than mailing paper copies. Gather no more than 3 pieces of supporting information that demonstrate why the nominee deserves a Lake Stewardship Award. Examples of the kinds of materials that may be submitted include: news articles highlighting the nominee’s efforts and contributions, materials developed by the nominee, or other awards or recognition the nominee has received for their lake-related efforts. Choose concise materials that are relevant to your petition encouraging the nominee’s selection as a Lake Stewardship Award winner. No more than 3 pieces of supporting information will be accepted (aim for quality over quantity). Please provide materials electronically if possible, rather than mailing paper copies.